I don’t need a special occasion to eat a cupcake. I don’t really need a special occasion to eat any sort of dessert for that matter. I’ll walk right into a cupcake shop on a random Sunday afternoon and walk right out, one bite in and three to go. It just so happened that THIS particular random Sunday was my father-in-law’s birthday so I actually had a reason to visit Fairy Cakes Cupcakery, which is just about a half mile from Hertel on Parkside, right across from the Buffalo Zoo. The party was in less than an hour and despite my time crunch, I knew that I didn’t want to bother with a typical sheet cake. Sheet cakes are for suckers. I’m better than that. I could sit here and talk about how friendly the Fairy Cakes staff is, how the cupcakes are all on display in cake stands for your viewing (and drooling) pleasure or how the seating area is so inviting you’d consider curling up next to the fireplace in your Bills snuggie…but I won’t. 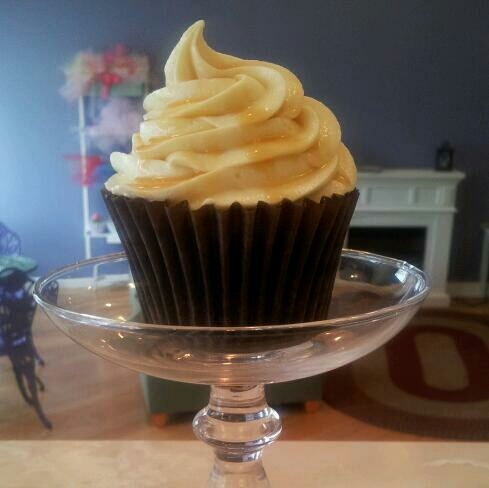 Instead I’ll get down to the nitty gritty – the double-chocolate cupcake with salted caramel frosting. Yep. Let the salivation begin. Only 3 words can describe this bad-boy. Oh. My. Gawd. First off, the only thing better than chocolate is double chocolate so there’s really no explanation needed on the actual cupcake. It was moist and that dense type of cake you’d find in a wedding cake almost. And then there was the frosting. This frosting isn’t your airy, light-as-a-feather type cake topper. This was a thick, creamy texture with just the right balance of sweetness to saltiness, almost like biting into a chocolate-covered pretzel. Bottom line, the perfect accoutrement to the cake. I’m going to expect you have one foot in the car already – destination: Fairy Cakes. As for me, finishing up bite #4.